Aluminum Air / Pneumatic Tire Portable Gantry Cranes -| EC & MW, Inc.
P Model Gantries – 1k & 2k LB Cap. 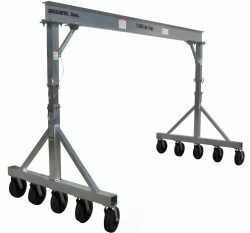 SB Model Gantries – 1k & 2k LB Cap. EC&MW’s Air tire gantry cranes, also referred to as Pneumatic tire gantries, are manufactured to the same high standards as all of our portable gantry cranes. Although we were not the first to invent the air tire gantry, we were the first in1998 to formulate and produce lightweight aluminum production models. Several years later other companies caught on to their unique asset to the moving and rigging industry. Their original design was for moving and relocating roof top HVAC systems. When properly used, it has been noted by customers, for having the ability to minimized/eliminated roof damages. 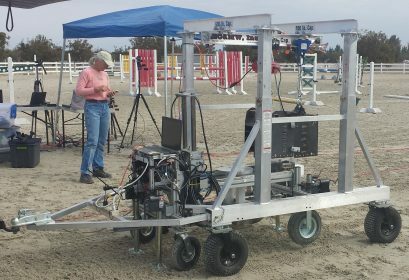 Later on we evolved the concept to our Animal Rescue portable gantry cranes, as well as Custom Models like the one shown to the right that was designed for UC Davis of Calif. Uses: Include construction sites where minimal uneven terrain is possible. Why: With larger diameter air tires they are forgiving on a packed soil terrain. They are not suitable for sand, gravel and loosely packed rock situations. Uses: They have also found their way for moving highly delicate electronic instruments. Why: Air tires provide unparalleled cushioning effect that really no other caster can provide. Our sister company, Hospital Rigging Supply, originally came out with our first Pneumatic Tire Caster Gantry in 1998. Others have again followed in our footsteps. Our pneumatic caster concept is in several of other models of gantries we manufacture. From our Animal Rescue to Fall Arrest and All-Terrain model gantries. Now! Which one is better for your application? Below we have listed pros and cons between models. 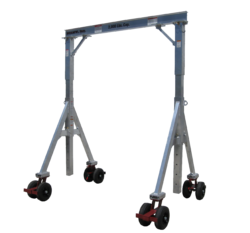 Multiple casters (8 or 10) over a 60″ to 68″ long base provides less concentration of load with a longer surface area. For a roof application, your load could span several roof trusses at once. Shorter base height for hatchways and transportation. Better mobility on slightly uneven surfaces. Standard with four position locking caster on (4) outside casters. Easier height adjustment on “smaller models“. Uses a 10.5″ diameter tire. Higher lifting ability on tallest models. Easier height adjustments on larger model sizes. Standard with four position locking pins on all (4) legs. Removable adapter plate allows for the use of our standard polyurethane casters. An additional cost does apply for Polyurethane casters. Uses an 8″ & 10.5″ diameter tire. More effort needed to reverse direction. Polyurethane casters are not available. Concentrated load on (4) points. Although there are (8) wheels total the footprint could be considered smaller. Taller main frame is harder to transport and maneuver in hatchways. Harder mobility on less even surfaces. Use of Polyurethane casters will lesson height in lifting ability. Multiple casters (8) over a 78″ long base provides less concentration of load with a longer surface area. For a roof application, your load could be span several roof trusses at once. Shorter base height for transportation. Uses a 16″ diameter tire. Concentrated load on (4) points. Although there are (8) tires total the footprint could be considered smaller. Taller main frame is harder to transport. This warranty is the only written or express warranty given by EC&MW, Inc. & Hospital Rigging Supply, Inc.
EC&MW, Inc. & Hospital Rigging Supply, Inc. warrants to the original buyer that this product shall be free from all defects in material or workmanship for a period of 10 years from date of purchase. This warranty does not apply to any product, which has been subjected to abuse, misuse, negligence, modification, overuse of its rated capacity, use of or storage in unforgiving environmental conditions, accident or normal wear beyond its serviceability of 20,000 hours. EC&MW, Inc. & Hospital Rigging Supply, Inc. cannot be responsible for any unlawful sale(s) by unlawful dealers and or any other 3rd party resellers. This includes ALL resales by either online or yard auctions. This warranty is not transferable and is valid only for the original buyer and does not include any subsequent resales. In no event shall EC&MW, Inc. & Hospital Rigging Supply, Inc. be liable for any expressed, implied, statutory and or incidental or consequential damages including but not limited to loss of work, loss of income or additional operating expenses. Notice of defect must given in writing within 60 days of receipt of goods. Upon the return (freight prepaid) to our factory. EC&MW, Inc. & Hospital Rigging Supply, Inc. will, if found defective, refund, repair or replace any part or the entire unit, with one of it or like model. Other manufacturer’s warranties will apply and supersede any warranty given by EC&MW, Inc. & Hospital Rigging Supply, Inc. For those warranties and repairs you must contact the individual manufacturer directly. Any alterations or misuse of this product will void all warranties and liabilities. Customer assumes all liability and risks resulting from the use of this product. This warranty gives you specific legal rights, and you may have other legal rights, which vary from state to state. Some states do not allow limitations on how long an implied warranty lasts, or allow the exclusion or limitations of incidental or consequential damages, so the above limitations or exclusions may not apply to you. All EC&MW cranes have a design factor of 15% of the allowable capacity for the weight of the hoist and 25% for impact. Please note that CMAA 74 references steel design. In the case of our aluminum cranes, the deflection may be greater than CMAA 74 specifies due to the lower modulus of elasticity of aluminum compared to steel. All aluminum extrusions used in the manufacturing of our aluminum products meets the ASTM International specifications ASTM B308 for 6061T6 Aluminum. © Copyright 2017 EC&MW, Inc. All Rights Reserved.